As the moon slowly pulls away from the Earth, our rotation is slowing down making our days longer. Very slowly, we are adding more time to our year; about 1/75,000 second annually. 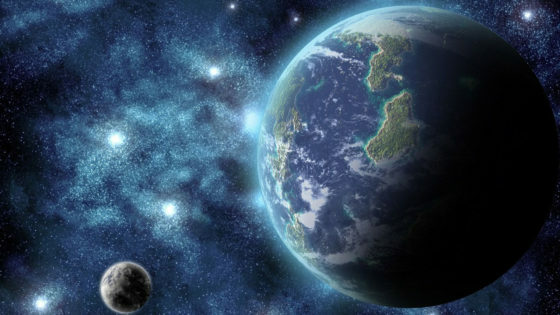 According to fresh calculations, a day on Earth was a full five hours and fifteen minutes shorter a billion or so years ago, well before complex life spread around the planet. According to the Guardian, that happens because the Earth’s rotation gradually winds down as the moon moves further away from the globe. Scientists used a combination of astronomical theory and geochemical signatures buried in ancient rocks to show that 1.4 billion years ago, the Earth turned a full revolution on its axis every 18 hours and 41 minutes. That number means that, on average, the length of the day on Earth has grown by approximately one 74 thousandths of a second per year since Precambrian times, a trend that is expected to continue for millions, if not billions, of years more. Meyers and Malinvern set themselves the task of reconstructing changes in the distance between the Earth and the moon, and variations in Earth’s orbit, along with wobbles and tilts known as Milankovitch cycles, further back in time than ever before. Until now, it has been difficult to work out reliable figures for more than 50 million years ago. Because Milankovitch cycles affect how much sun reaches the planet’s poles, they are prime drivers of climate change over timescales ranging from tens of thousands of years to millions of years. To pin down the frequency of the cycles in planet Earth’s long history, the scientists looked at copper and aluminum ratios linked to climate changes in the 1.4 billion-year-old Xiamaling marine sediment in northern China, and the 55 million-year-old Walvis ridge in the south Atlantic, and fed these into a model. As for the moon, the scientists say, it won’t forever be pulling away from the Earth. Eventually, it will settle on a comfortable distance and remain there. But it will never be seen by half of Earth, and much further away to the half that will still be able to see it.